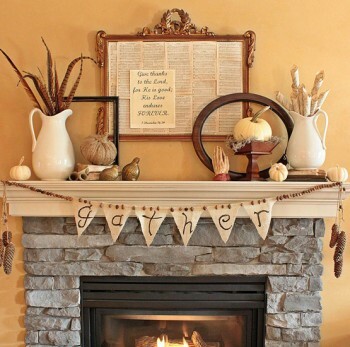 Allow these three principles to guide your decorating for your Thanksgiving fireplace and fireplace mantel, and you’ll love the results! 1. 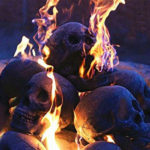 Respect the existing color scheme in the room when you decorate the fireplace for Thanksgiving. Mason jars and blue lettering on the Thanksgiving banner echo the blue tiles of the fireplace. Photo courtesy thelilypadcottage. 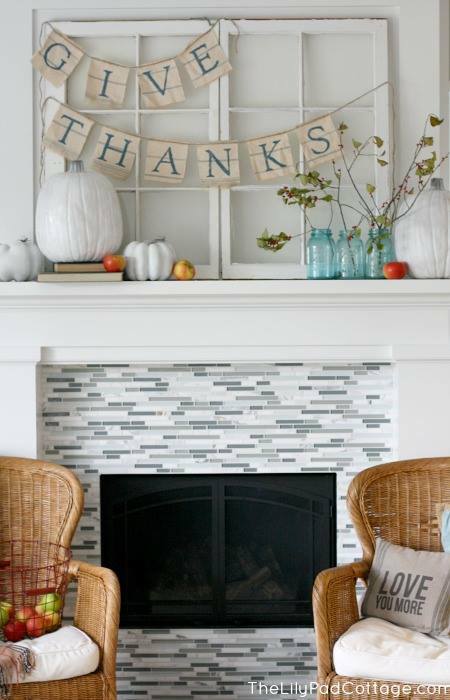 The fireplace mantel above echoes the lovely blue tiles in fire fireplace both in the blue mason jars and in the Give Thanks banner. 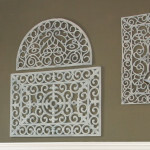 The white and gray of the tiles are repeated in the painted white pumpkins with gray stems. Natural greenery and autumnal apples give just the right pop of color. 2. 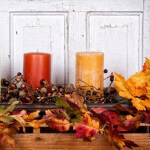 Take your cues from nature’s natural tones for fireplace decorating at Thanksgiving. Whether feathers, pine cones, or wood, nature’s subtle tones set the color scheme for this Thanksgiving fireplace. Photo courtesy thebungalowblog. 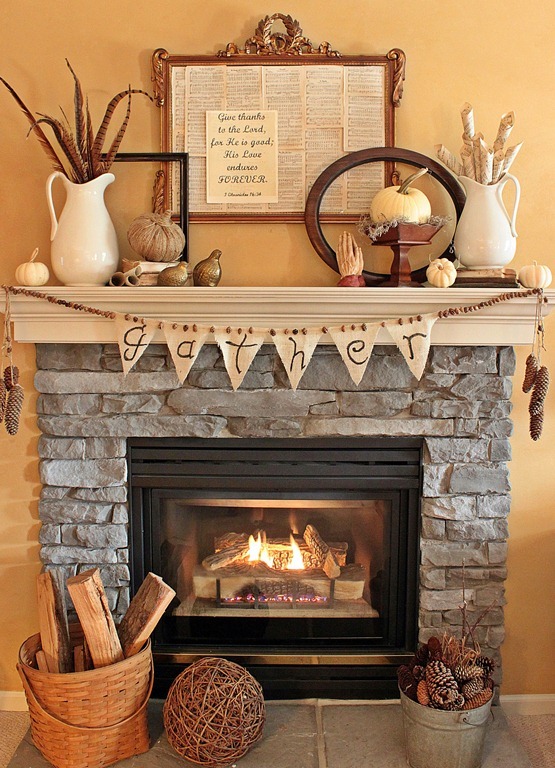 Acorns and pine cones, twine and burlap, wood and aged paper: the harmonious color scheme of this Thanksgiving fireplace takes its cue from nature. Cream tones in the pitchers, papers, and pumpkins provide bright highlights. Even the natural gray stones’ tone is picked up in the galvanized pail sitting on the hearth, invitingly filled with pine cones and twig as fire starters. 3. 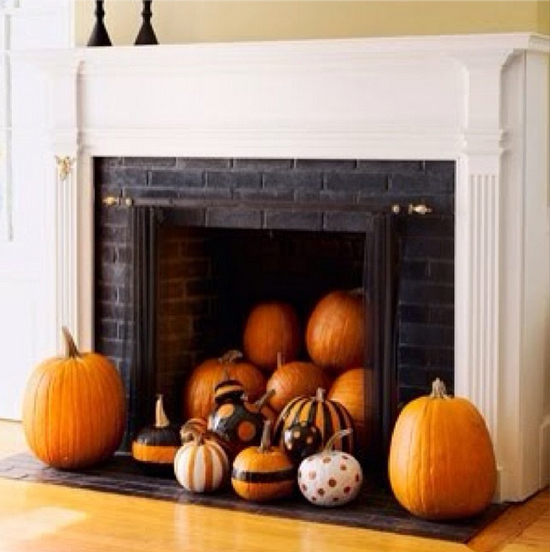 Think pumpkins, pumpkins, and pumpkins to decorate the fireplace for Thanksgiving! Pumpkins grow not just in traditional orange, but also in white and cream. And if they aren’t in the color you need, a can of spray paint transforms them into the pumpkins of your dreams. By using multiple paint colors, SugarSweetHomes accents the front-and-center pumpkins in the display above. 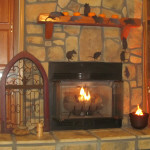 Unpainted pumpkins fill the firebox and frame the sides of the hearth. 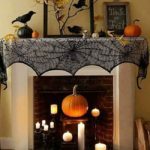 An unused fireplace (also known as The Black Hole) was transformed into the room’s focal point with a theme that works from Halloween through Thanksgiving. A pumpkin is cleverly positioned atop a candle holder to provide height to the arrangement above. 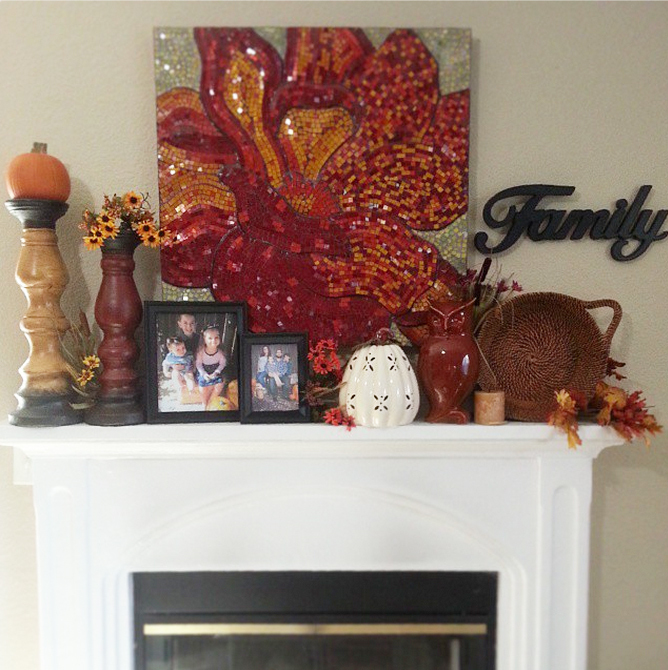 The striking mosaic’s autumn colors show up within the mantel display’s ceramic owl, autumn flowers, fall leaves and candle holders. And the black accent of the Family plaque is carried through in the photo frames and top and bottom bands of the candle holders. 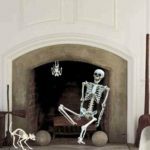 When decorating your fireplace for Thanksgiving, start with the existing colors of the room in mind, add elements of nature – including plenty of pumpkins – in natural tones, and you will have a display worthy of the Thankful Spirit of the season. Last updated by Susan at September 27, 2016 . 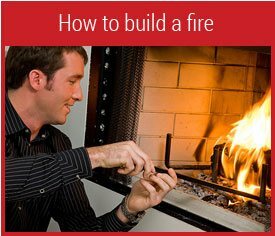 ‹ Fatwood Fire Starter Kit Giveaway!